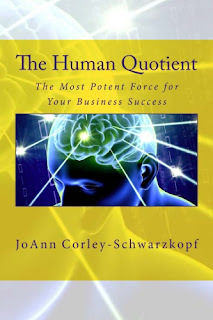 JoAnn Corley-Schwarzkopf | NewSchool Management: Let's Restore Humanity To Business - Are You In? Let's Restore Humanity To Business - Are You In? A potent force lies deep within every actor in business...a force so strong it can fuel a vision, make or break a dream. It’s a power so remarkable it conjures inventions that have changed the course of civilization as we know it. This force is the human force - the human quotient in business. It's time to shake off the burdensome, blinding corporatism that is robing us of the full exhilarating expression of this extraordinary force (yes, it can be that way sometimes!). This force translated into work renders meaningful contributions to...creates value for those around us, no matter the endeavor. Whether concocting the next big tech thing or making bread that feeds the world, all work has value and should be honored and appreciated. We come to work bringing that force, the most precious thing we have - manifested as our unique "human resourse". That resource -- our heart, mind, spirit. body and all that entails is ultimately who we are - the essence of our being. And every day we each decide how and to what degree we'll offer those precious resources to another's dream or vision while hopefully serving our own. It is a delicate dance. Great dancing, beautiful dancing, skilled dancing requires a partner -- a partner equally skilled with complimentary contributions, appreciative of the deliberate union. This is really the experience of work, of business no matter the role. And yet for many it's tainted - diminished to a compulsory participation in a battle for survival fraught with skirmishes for dignity, respect and appreciation. Work can be a continuous, gratifying validation of our customized contribution to an endeavor, rather than laced with looming threats to the very essence of our humanity. Can you imagine -- going to work every day not knowing how you'll be treated?...not being paid respectfully while millions are derived from the most precious resources on the planet...and I'm not talking diamonds, but rather the mind, body, spirit of every employee - those are the diamonds. It's time for a business reset! As business leaders, it's time to reclaim and celebrate humanity and its contributions to our enterprises. Our enterprises - their operations, processes and management - have become so formalized it can sometimes feel and be dehumanizing. The more formalized, the more disconnected we seem to become from common sense and natural ways of interacting and just being...to the point of the ridiculous. Even the function of Human Resources can sometimes feel less human. And, as technology advances its way into utter dominates of every operational aspect of business, the value of our humanness seems to be subjugated to its rule. The call of the hour for every business leader, in every aspect of business, is to consciously, intentionally hang onto, cling to our humanness -- it is life itself...and is in fact the source of our greatest business success. // JCS Business Advisors is a strategic business management consultancy via our expertise in human behavior, we partner with forward-thinking senior leaders, entrepreneurs and their HR counterparts to bridge the knowledge & execution gap of connecting people, performance, and profits, resulting in high-performing leadership teams and organizations. // email: joann@jcsbusinessadvisors.com // Ph: 888.388.0565 // Schedule a complimentary advisory call and receive a copy of our latest executive briefing. Learn about our "all-in-one" system that develops competent leaders and managers, effectively manages operations, people & talent. Labels: business, human resource, humanity, management, the human quotient.